Nanoparticles can be found in processed food (e.g. food additives), consumer products (e.g. sunscreen) and even in medicine. While these tiny particles could have large untapped potential and novel new applications, they may have unintended and harmful side effects, according to a recent study by researchers from the National University of Singapore (NUS). Specifically, NUS researchers found that cancer nanomedicine, which are designed to kill cancer cells, may accelerate metastasis. Using breast cancer as a model, they discovered that common nanoparticles made from gold, titanium dioxide, silver and silicon dioxide – and also used in nanomedicines – widen the gap between blood vessel cells, making it easier for other cells, such as cancer cells, to go in and out of "leaky" blood vessels. The phenomenon, named 'nanomaterials induced endothelial leakiness' (NanoEL) by the NUS team, accelerates the movement of cancer cells from the primary tumour and also causes circulating cancer cells to escape from blood circulation. This results in faster establishment of a bigger secondary tumour site and initiates new secondary sites previously not accessible to cancer cells. "For a cancer patient, the direct implication of our findings is that long term, pre-existing exposure to nanoparticles – for instance, through everyday products or environmental pollutants – may accelerate cancer progression, even when nanomedicine is not administered," explained research co-leader Associate Professor David Leong from the Department of Chemical and Biomolecular Engineering at NUS Faculty of Engineering. He added, "The interactions between these tiny nanomaterials and the biological systems in the body need to be taken into consideration during the design and development of cancer nanomedicine. It is crucial to ensure that the nanomaterial delivering the anti-cancer drug does not also unintentionally accelerate tumour progression. As new breakthroughs in nanomedicine unfold, we need to concurrently understand what causes these nanomaterials to trigger unexpected outcomes." The study, jointly led by Associate Professor Leong and Associate Professor Ho Han Kiat from the Department of Pharmacy at NUS Faculty of Science, was published in scientific journal Nature Nanotechnology on 28 January 2018. Fortunately, the situation is not doom and gloom. The NUS researchers are harnessing the NanoEL effect to design more effective therapies. 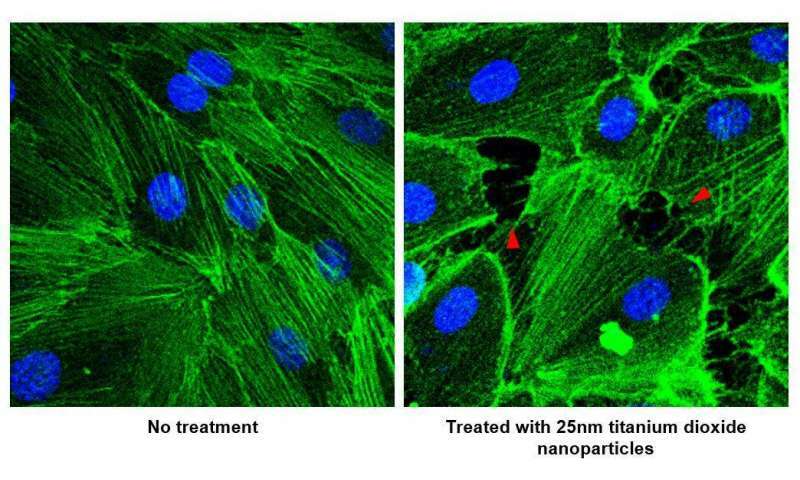 For example, nanoparticles that induce NanoEL can potentially be used to increase blood vessel leakiness, and in turn promote the access of drugs or repairing stem cells to diseased tissues that may not be originally accessible to therapy. Associate Professor Leong said, "We are currently exploring the use of the NanoEL effect to destroy immature tumours when there are little or no leaky blood vessels to deliver cancer drugs to the tumours. We need to tread this fine line very carefully and optimise the duration at which the tumours are exposed to the nanoparticles. This could allow scientists to target the source of the disease, before the cancer cells spread and become a highly refractory problem." Associate Professor Ho added, "Moving beyond cancer treatment, this phenomenon may also be exploited in other conditions where a failure of leakiness is a key feature. For instance, organ injuries such as liver fibrosis may cause excessive scarring, resulting in a loss in leakiness which reduces the entry of nutrient supplies via the blood vessels. Both our research groups are now looking into leveraging the NanoEL effect to restore the intended blood flow across the scarred tissues." What is nanomedicine, and how can it improve childhood cancer treatment? Important that the time-line of the appearance of the distribution of nanoparticles in human populations be noted for comparison with prior data concerning disease type and epidemiology.